The information in these indexes was extracted from original sources and entered into a database. Because there is no list of actual sources used for the indexes, and no list of place names included, it is hard to determine if the collection is useful to your area of German research without trying a search. (FamilySearch: If you are reading this, consider adding a listing of all localities or microfilm rolls used!) I tried my various Bavarian lines and found a few familiar names, but to summarize my findings I will echo a previous posting of mine – An Index is Only as Good as Its Spelling. When using these indexes, beware of name errors. 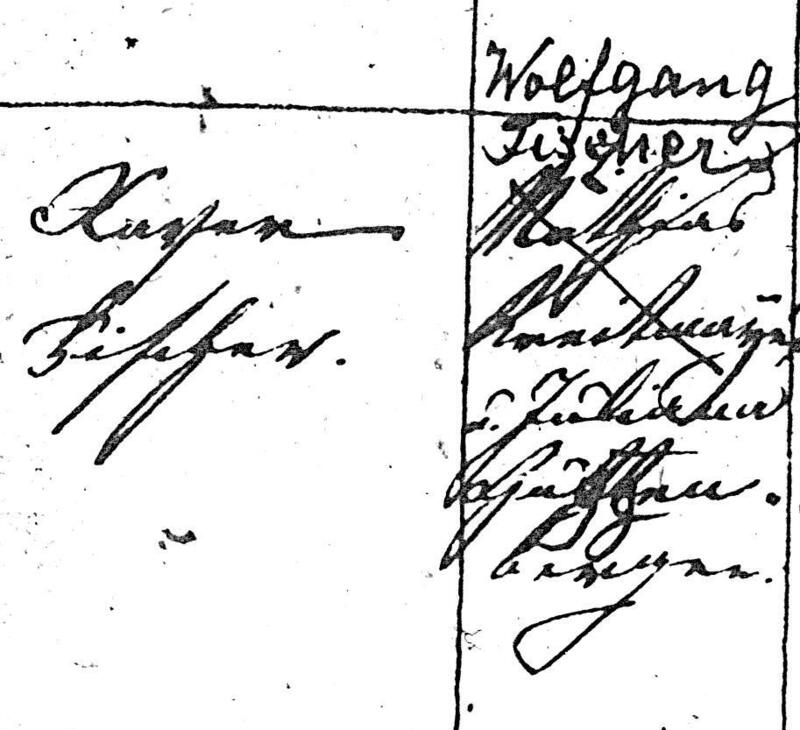 For example, I searched for the names of my 4th great-grandparents, Wolfgang and Juliana Fischer. In my previous research using original records that were microfilmed by the LDS, I learned their names in the marriage record of their son, Franz Xaver Fischer, and his bride, Barbara Gürtner (my 3rd great-grandparents). On 21 May 1839, Xaver Fischer marries M. Anna Breu in Pfaffenhofen. The index has Xaver’s (or Franz Xaver, depending on the record) correct date of birth and birthplace – 06 Oct 1813 in Langenbruck. His parents are listed as Wolfgang Fischer and Juliana Huffenberger. The source film number is listed as 816429, which is Heiraten, Tote 1827-1872 – Kirchenbuch, 1732-1888, Katholische Kirche Fahlenbach (BA. Pfaffenhofen). Next, Xaver’s sister Theres Fischer, born 11 May 1816 in “Agilberg” [which is incorrectly spelled in the index and should be Agelsberg], marries Joseph Rainer on 25 Feb 1840 in Waal. Her parents are listed as Wolfgang Fischer and Juliana Guggenberger. The source film number is 817563, which is Taufen 1864-1882 Heiraten, Tote 1803-1878 – Kirchenbuch, 1551-1956, Katholische Kirche Waal (BA. Pfaffenhofen). The third record is for Xaver’s marriage on 27 Apr 1841 in Pfaffenhofen. Since he is now listed as a widower, it is presumed his first wife died. His birthdate and place are the same as the previous record. The bride’s name is listed as Barbara Hürtner (born 14 Dec 1814). Xaver’s parents are listed as Wolfgang Fischer and Juliana Huttenberger. The source film number is 816429 (same as above). So, is Julianna’s maiden name Huffenberger, Huttenberger, or Guggenberger? 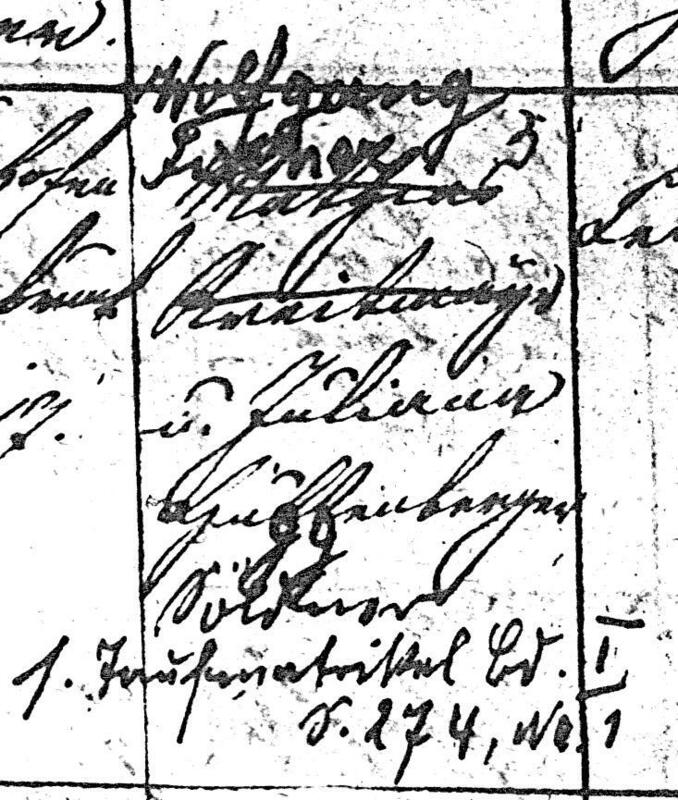 Well, based on viewing the original source for Franz Xaver’s birth as well as his marriages, my guess was Guggenberger – despite the fact that the index lists her name as Huttenberger for the marriage record to my ancestress. It should be noted that the indexer also records Gürtner as Hürtner, so maybe they had difficulty distinguishing the priest’s handwriting for G’s and H’s. Mother's name in birth record for Fr. Xaver Fischer, born 06 October 1813 in Langenbruck, Bavaria. Source: Katholische Kirche Fahlenbach (BA. Pfaffenhofen). Kirchenbuch, 1732-1888. FHL Microfilm 816428, Taufen 1736-1816. In the two marriage records for Xaver (who did not use “Franz” as a first name), it is easy to see why an indexer may have difficulty with the mother’s name. In both records, the “gg” in the name appears to be written over a “tt”. His father’s name is written over a crossed-out stepfather’s name since his father, Wolfgang, died when Xaver was a young boy. 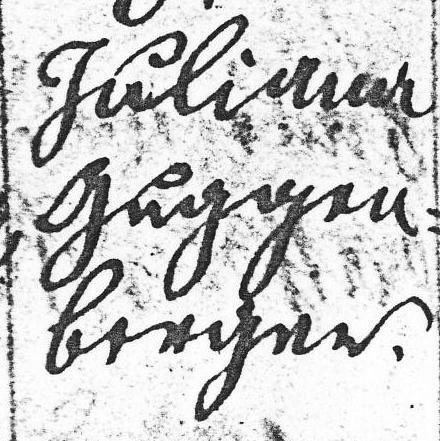 Xaver's parents' names on his 1839 marriage record. Source: Katholische Kirche Fahlenbach (BA. Pfaffenhofen). Kirchenbuch, 1732-1888. FHL Microfilm 816429, Heiraten, Tote 1827-1872. Xaver’s first wife died shortly after giving birth to their first child, Casper, in December, 1840. The baby also died at 10 days old. Xaver found a new wife five months later, which was a necessary custom of the time. As you can see from the original records, it is easy to understand why the indexer could not get the name “right”. I would not be sure of the correct spelling unless I looked at other sources, such as Xaver’s birth. I do not have a copy of Xaver’s sister’s marriage, which is the only one of the 3 indexed records to show “Guggenberger” as the mother’s name. Interestingly enough, I have the record of Juliana’s second marriage after Wolfgang Fischer’s death. In it she is listed as the widow Juliana Fischer, but her parents’ names or birth information are not provided. I have not been able to locate the marriage of Wolfgang and Juliana either. Just as you can’t trust online family trees without verifying the information by using original sources, you also can’t trust online indexes. In the case of the indexes I list above, you are not able to see the original records online, but the source microfilm number is provided. It is highly suggested that you turn to that source to confirm and verify. Because the indexes can be wrong – as shown above – it is also recommended that you try a variety of spellings when performing name searches. In fact, if you click on “advanced search”, you can even search for a first name “Wolfgang” and a spouse name of “Juliana”, then narrow down the results by choosing a particular collection of records (I can’t figure out how to do this in the “beta” but the regular FamilySearch allows it). This won’t work very well with overly common names, but for unusual first names it might work. It is also important to note that FIRST names don’t follow any set rules in the indexes either. For example, Josef may be indexed as Josef, the anglicized Joseph (though it wasn’t likely to actually say that in the German record), or the Latinized Josephum. While these indexes can be a useful tool in guiding you to other sources, they are just that – a tool. The indexes should not be used as an original source, but instead should lead you to that original record source. Take note of the record’s source information, look up that microfilm roll in the catalog, and then order it to check it for yourself. When you try the indexes, keep an open mind when it comes to spellings, because you might miss out on a potential source if you are too “strict” with your spelling choices! Meaning/Origin – The surname FISCHER really does mean “fisher” as in “fisherman.” According to the Dictionary of German Names, Second Edition by Hans Bahlow, the frequency of the name in Germany “is evidence of the former importance of this ancient occupation.” I find it ironic that my particular Fischer’s were actually farmers! Recorded in several spelling forms including the popular Fisher (English), Fischer (German), Fiszer (Czech and Polish), Visser (Dutch), de Vischer (Flemish), Fiser (Danish), Fisker (Norwegian), and many others, this interesting surname does seem to have a pre 7th century Old English origin. If so it is from the word ‘fiscere‘ meaning to catch fish, and it may be an occupational name for a fisherman, or it may be a topographical name for someone who lived near a fish weir on a river. Here the derivation is from the word “fisc” plus the Middle English “gere” a development of the Old Norse “gervi” meaning weir or apparatus. It may in some case be an Ashkenazic name for a fisherman from the Yiddish word “fisher“. According to the World Names Profiler, for the spelling FISCHER the countries with the highest frequency per million residents are Germany with 3,369 individuals per million, Switzerland wtih 3,104, and Austria with 2,139. The next highest countries (and their respective frequency per million) are Hungary (605), Denmark (559), Luxembourg (553), the United States (359), and Canada (267). The English spelling FISHER seems to be slightly less popular, and the countries with the highest frequency per million residents are Australia with 1,211 individuals per million, the United Kingdom with 1,087, the United States with 914, Canada with 864, and New Zealand with 821. Spelling Variations – As noted above, the most common variation is FISHER. German variations include Fäscher, Ficher, Fischera, Fascher, and Vischer. 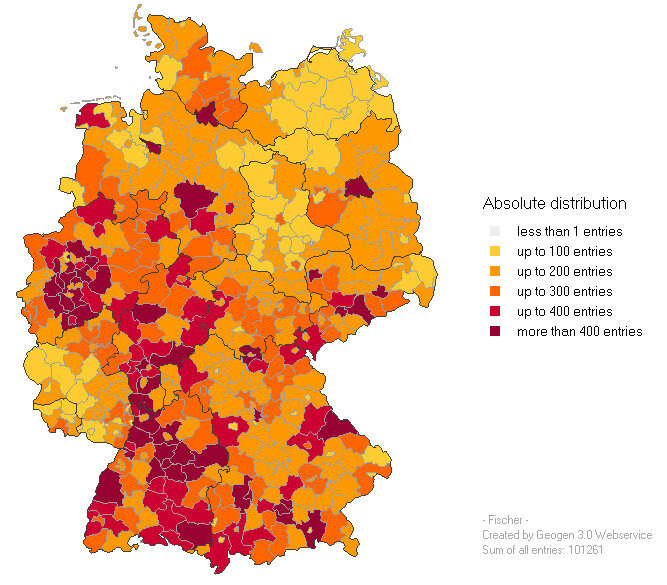 Distribution of the surname FISCHER in Germany. SOURCE: Geogen Surname Mapping database, http://christoph.stoepel.net/geogen/en/Default.aspx, accessed January 16, 2010. 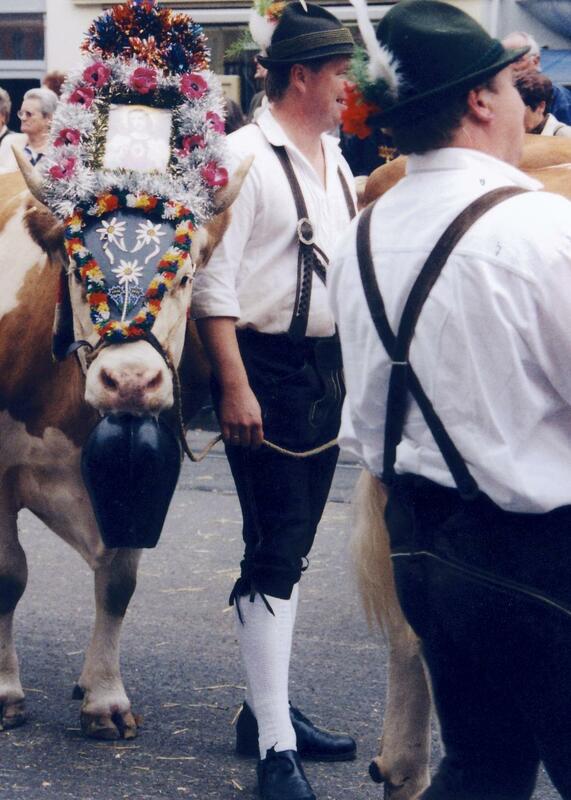 In Austria, the name was the 15th most common surname, and most Fischer’s live in the Wien area. Distribution of the surname FISCHER in Austria. Famous Individuals with the Surname – There are many, many famous people with this surname including American chess champion Bobby Fischer, American actress Jenna Fischer, and German historian Fritz Fischer. Wikipedia has a list of all the famous people with the Fischer surname. My Family -My FISCHER family comes from Bavaria, and it is the surname of my great-great-grandmother, Margarethe Fischer. My line of descent is as follows: Wolfgang Fischer (1775-1820) > Franz Xaver (b. 06 Oct 1813 in Agelsberg – d. unknown) > Margarethe (b. 21 Jan 1845 in Langenbruck – d. 04 Oct 1895 in Pfaffenhofen an der Ilm). Margarethe married Karl Echerer on 18 May 1874 after her first husband, Bartholomew Kufer, died. Their first child was Maria, born on 27 February 1875 – my great-grandmother. Maria married Joseph Bergmeister in 1897 and they immigrated to the United States. More information on their children can be found on the Bergmeister Family Page. Maria’s youngest child, my grandmother, was named Margaret – presumably after her mother’s mother. Margarethe and Karl had at least three other daughters, Magdalena, Teresia, and Christina, but I have not yet discovered if they lived to adulthood. They also had at least one son, Karl, who was born on 28 June 1878. My Research Challenges -My Fischer line is short so far. 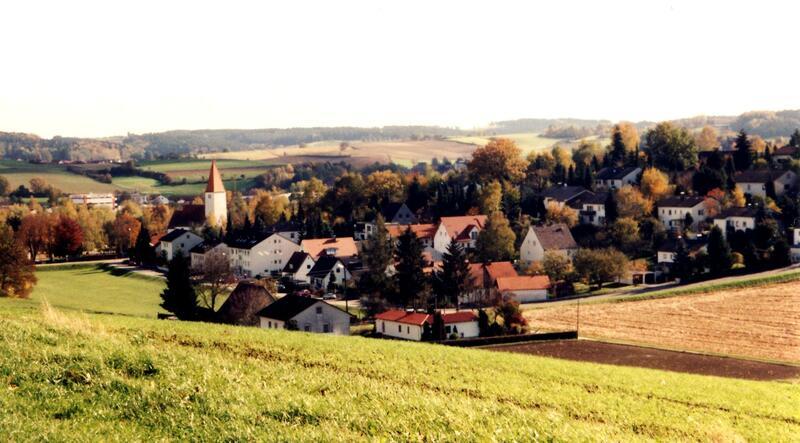 The towns of Agelsberg and Langenbruck are very small, and the church is located in a town called Fahlenbach. The LDS has microfilmed church records for this town going back to 1732, so I should be able to learn the names of the parents of Wolfgang Fischer. Other Fischer Families -With a name as common as Fischer, there are a lot of other people researching Fischer’s! There is a Fischer Family Genealogy Forum as well as an Ancestry Fischer Message Board. Fishergenealogy.com has a list of those researching both the Fischer and Fisher surnames. Links to all posts about my Fischer family can be found here. This post is #6 of an ongoing series about surnames. To see all posts in the series, click here. Since today is “Labor Day” in the United States, I wanted to take a look at my ancestors’ occupations. Some of the jobs are still performed in much the same way today as they were in my ancestors’ times. My grandfather James Pointkouski (1910-1980) was born in the right century to be a truck driver, and the medium-size delivery trucks he drove are quite similar to those used by his fellow Teamsters today. My great-grandfather Joseph Bergmeister (1873-1927) was a baker, an occupation that has changed very little over centuries – in fact, today his cousins are still making wonderful things in the same bakery his uncle founded in 1868. My carpenter ancestors, 4th great-grandfather Karl Nigg (1767-1844) and 5th great-grandfather Johann Baptiste Höck (1700’s), would be in as much demand today as they were back then. Do you have any idea how hard it is to get a good carpenter these days? Similarly, Karl’s father and grandfather, Phillip Nigg ( ?-1774) and Martin Nigg (or Nick), were masons – bricklayers. The construction business will always be in demand! But many other jobs of my ancestors no longer exist in the same way. Some of the factory jobs of my 20th Century ancestors, such as the Pater family who all worked in clothing factories as weavers, still exist – but you won’t find the industry as prevalent in the United States as it was when they were working. Many of the other occupations of my ancestors have become outdated with modern times. For example, one of my 5th great-grandfathers, Franciszek Świerczyński of Mszczonów, Poland, was a carriage-maker in the 1800’s. Since carriages have been replaced by cars, I imagine that he’d be in another line of work today. I have shoemakers on both sides of my family. My 4th great-grandfather, Ignacy Pluta (1821-?) from Mszczonów, Poland (he married the daughter of the carriage-maker), was one as was his father, Ludwik Pluta. In Pfaffenhofen an der Ilm, Bavaria, I have traced over six generations of shoemakers from my Echerer line. The first Echerer son to be something other than a shoemaker was Karl (1846-1880s), who took up the occupation of his mason great-grandfather instead. While we still need shoes today, their construction has changed. Some shoes today are still hand-crafted with leather, probably using the same methods my ancestors used. Most shoes are mass-produced, and it would be hard to make a living as a shoemaker today unless you were a factory worker. The more you research your genealogy and the farther back you go, the more interesting occupations you’ll find. Some will be “modern”, like my innkeeper ancestor. Others, like the glassmaker, still exist but today the job is more of a “craftsman” trade or art that is more specialized. Again, modern machinery makes many of the things our ancestors once made by hand. One of the more unique occupations in my family history is that of my 3rd great-grandfather, Franz Xaver Fischer (1813-?) from Agelsberg in Bavaria. He was listed as a söldner, which translates as mercenary. Mercenary? I was intrigued and pictured a soldier of fortune, hired out to neighboring countries. Until I learned the Bavarian meaning of the word… A sölde is a small house with a garden. 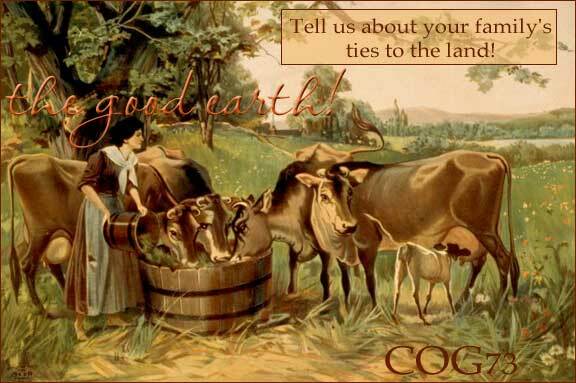 For tax purposes, there were different designations for farmers. A bauer owned a whole farm, a Halbbauer owned half, and a Viertelbauer owned a quarter. Then there was the söldner, who owned either 1/8, 1/16, or 1/32 of a farm. My mercenary was a poor farmer! Well, not too poor – there was a further designation called häusler – they owned a house, but not the land. Old Time Job Descriptions – sometimes, even English jobs need some translation!